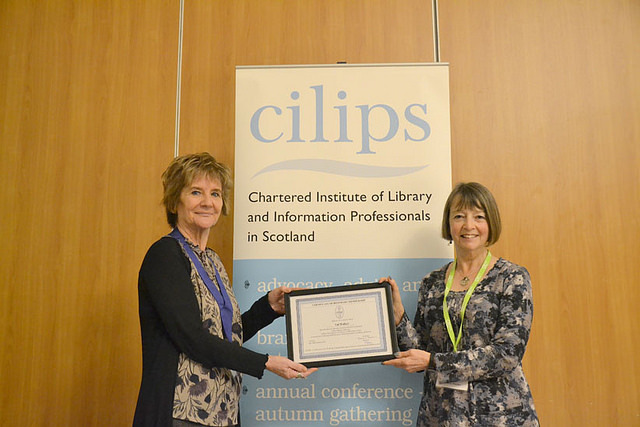 Honorary membership is awarded by the members of Scottish Library Association (SLA) now Chartered Institute of Library and Information Professionals in Scotland (CILIPS) for services to the CILIPS, libraries, information services or the wider profession. 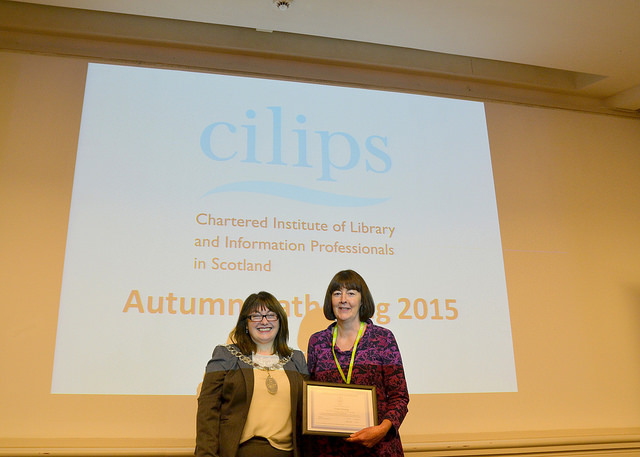 It is an honorary title that does not replace membership of CILIPS. Why not nominate someone you think deserves it? Nominations should be sent to admin@cilips.org.uk and include the name of the nominee and the name of 2 people nominating them. 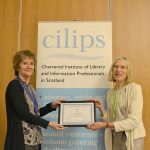 Only CILIPS members may offer nominations for this award but they can be given to both current members and non-members of CILIP. The information on Honorary membership from 1914 to present was found using information compiled by Audrey Walker and from previous SLA and CILIPS newsletters. Rosemary was born in Dunbar and studied social and economic history at the University of St. Andrews. After graduation she worked in W&R Chambers as a reference editor before becoming the literary editor of Scotland on Sunday. This was followed by a spell as editor of Life & Work, the Church of Scotland’s magazine, before returning to newspapers as literary editor of the Herald, and later also of the Sunday Herald. Rosemary led the Literature Working Group which reported in February 2010. The Group was set up to examine the provision for all areas of literature: fiction, poetry, non-fiction, journalism, children’s books, and to address the needs of publishers and literary magazines; and of festivals, libraries, and all bodies working to promote literature. In 2007 she published Scotland: The Autobiography: 2000 Years of Scottish History By Those Who Saw It Happen, which has since been published in America and Russia. In 2012, she addressed our annual Conference on the significance and centrality of reading at the heart of the library and is a vocal and well known supporter of the value of libraries. Anabel is a librarian at large since retiring from her post at Strathclyde’s Jordanhill Library. Her career started in public libraries where she remained for 10 years before moving to the academic sector in 1990, specialising in early and primary education. For many years Anabel was responsible for the Children’s Literature Collection at Jordanhill Campus Library until it closed in July 2012. For much of her career Anabel has been involved with Scottish Academic Libraries Co-operative Group (SALCTG), which provides training courses tailored to the needs of the academic library community. Since her retiral Anabel has found a new career as a speaker on library related topics and is lauded as the instigator of the Glasgow Library Tweet ups. She gas organised many Glasgow based tweet ups which have become well supported and popular events in the library calendar. She is also responsible for bringing the first libcamp to Glasgow later this month and this ‘sold out’ very quickly and we applaud her drive and initiative in also finding time to be a volunteer at Glasgow Women’s Library too! Kathy’s expertise lies in cataloguing and classification and she is a longstanding member of the Cataloguing and Indexing Group Scotland. In this role she has served as a representative on CILIPS Council for many years. During that time she has seen many changes and faced many challenges but has never been afraid of speaking up and speaking her mind. Her questions and contributions have brought clarity to many discussions and over the years she has set an example for others to follow. Kathy’s colleagues appreciate and respect her as an active, committed and voluble Committee member, missing few meetings and always ready with comment and constructive criticism. 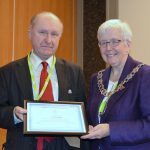 Peter served as President throughout 2012 in one of the most difficult periods of CILIPS’s history – the disaggregation from the working partnership with SLIC. 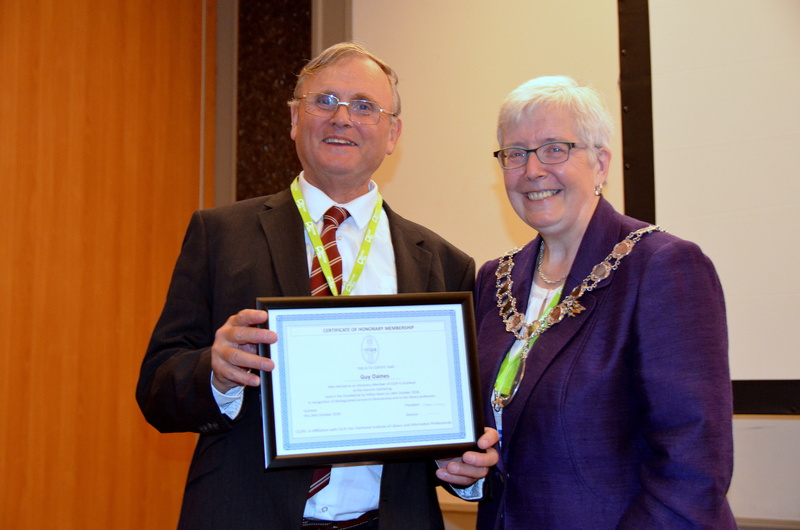 Peter played a key role in setting the new direction for CILIPS as well as carrying out his presidential duties. Throughout he provided a model of professionalism and good humour while never ducking away form some difficult decisions. 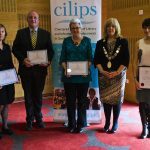 His love for the profession is clear in all that he does and CILIPS is extremely proud of the presidential example he set. 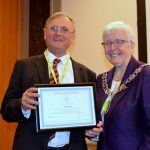 His dedication to CILIPS is evident in all that he does and the level of support he has given (and continues to give) to our organisation. When not working for CILIPS, Peter is Professor of Librarianship and Head of Department of Information Management at Robert Gordon University where he is responsible for the academic direction of the Information Management discipline within the School. He leads the Information Services module and jointly teaches the Information Governance module on the MSc Information Management. Peter is also responsible for the specialist Continuing Professional Development (CPD) module on Local Studies Collection Management. 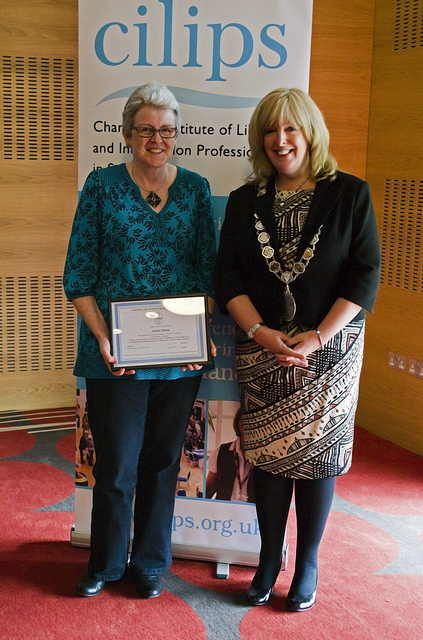 Sheila Miller will be well known to colleagues in the public library sector and to CILIPS staff and councillors. 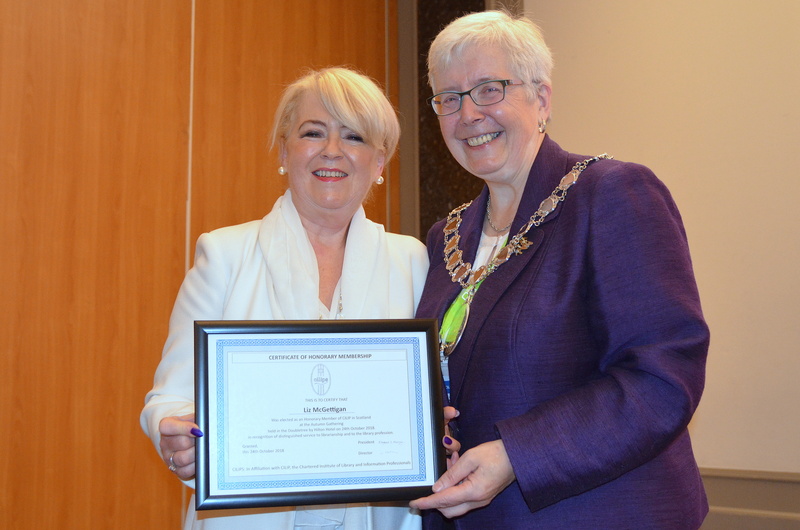 For many years she served on CILIPS Council and as Chair, steering CILIPS through one of the most transformative periods in its history. Those who know Sheila refer to her as a very loyal, discreet and supportive colleague and a very good friend. Sheila was born and educated in Falkirk. She studied librarianship at RGU before joining Stirling District Council. After leaving to have children, Sheila returned to work in Falkirk before heading back to Stirling Council where she spent the rest of her career. Sheila is a very talented person and has a wide range of interests including knitting and sewing. 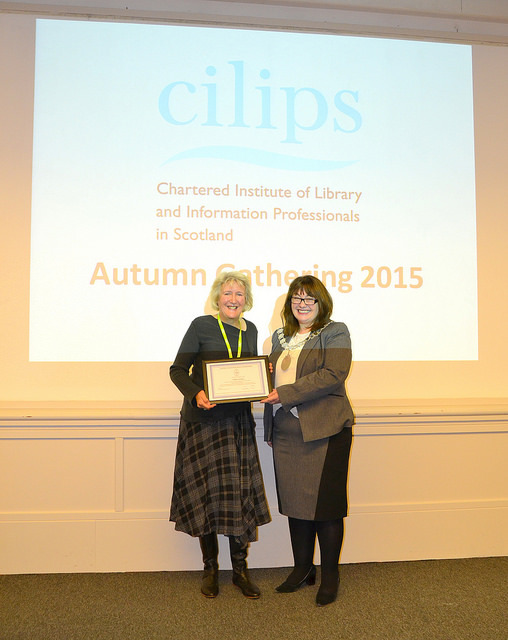 She retired from Stirling and from CILIPS Council in 2012 and is now enjoying retirement. 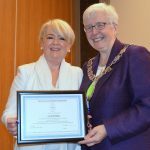 Audrey is currently Head of Service (Education and Skills), Community and Culture at North Ayrshire Council but it is for her work as CILIPS President in 2013 that she is honoured here. 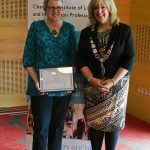 Audrey took up the presidency in a year of great change for CILIPS and carried out her role with professionalism and care. Audrey’s theme for her presidential year was ‘Making a difference’ and she certainly did that by planning one of our best attended conference ever. During her year she visited Branches and UK conference always making sure that she used every opportunity to remind all our stakeholders just how important libraries are, and providing all the arguments as to why libraries should continue to be a priority, using her wider experience to set them in the context of early intervention, prevention and community empowerment. Many will be familiar with her recently published research report for SLIC – The Impact of School Library Services on Learning which forms a neat symmetry with perhaps her other groundbreaking work – The Impact of the School Library Resource Centre on learning back in 1999. 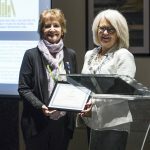 Cathy recently retired, but is being honoured for her dedication to the cause of lifelong learning during a long career in public libraries. Throughout her career, she has been a vocal and active advocate of the role of public libraries in learning. Currently Principal Librarian at Children’s Services, Falkirk. She is being honoured for her work within Youth Libraries Group Scotland as a Committee member and former Chair; for long years of dedication and service on CILIPS Council and for her continuing work as Chair of the School Libraries Advocacy Group and representative for Central Branch on the Scottish CPD Network. Robert is currently Director of Library Services at Glasgow Caledonian University although his career has seen him hold posts across schools, public libraries and higher education. 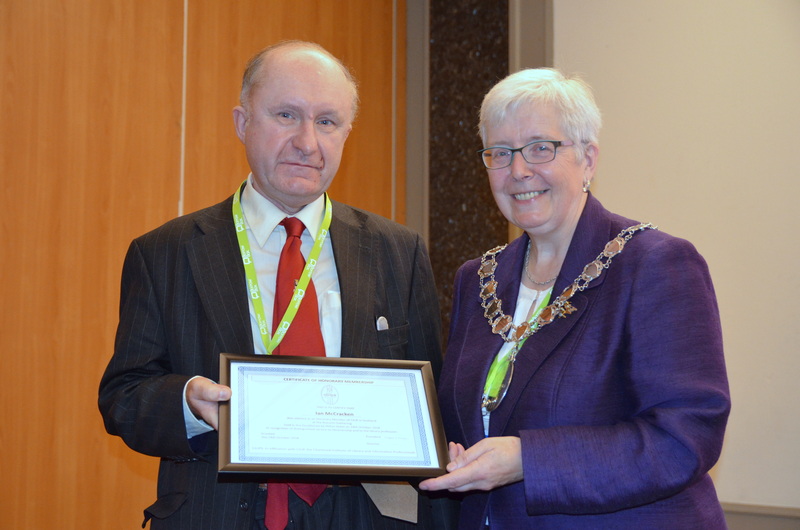 As CILIPS President last year, he was a key member of the Public Libraries National Strategy Group and continues to work with CILIPS in his role as Immediate Past President as both a Trustee and Chair of the Consultative Council. 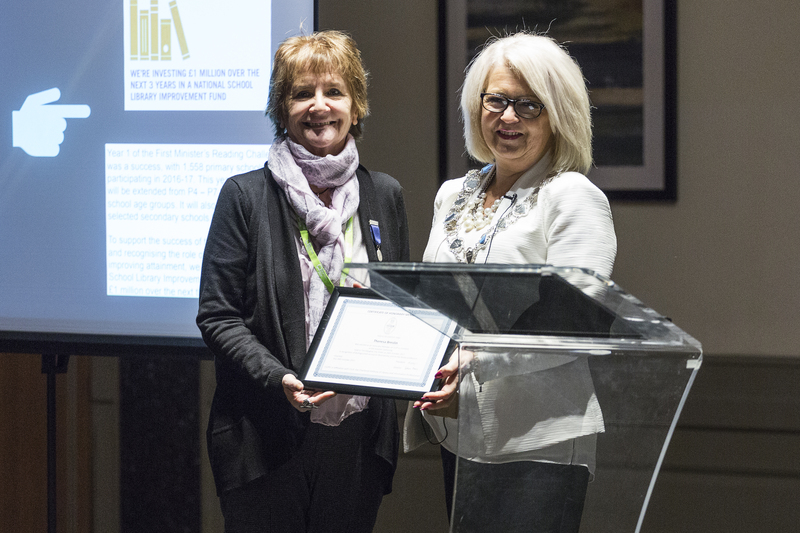 Jeanette was honoured for her dedication to libraries and the profession throughout her career and in her role as CILIPS President where she offered encouragement and inspiration to the membership. Jenny is a passionate and knowledgeable advocate for the role of professional librarians in schools. 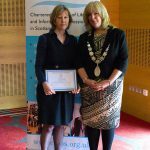 As head of Tobermory High School, she ensured that the library was at the heart of the school, mentored her librarian through chartership, and ensured that the school library was recognised in the HMIe Inspection Report as an outstanding feature of the school. Jenny is now working hard with the Save Scotland’s school libraries campaign. 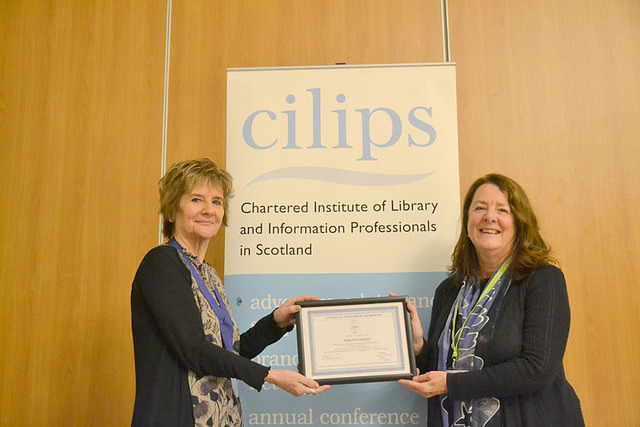 Paulette was honoured for her work with the CILIPS Special Interest Group, Multimedia and Information Technology Scotland where for many years she served as Treasurer of the Group. She retired earlier this year from her post as Library Manager at Historic Scotland. 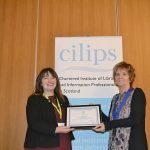 Ruth was honoured for her work in supporting candidates through professional registration travelling the length and breadth of Scotland delivering workshops on behalf of CILIP. 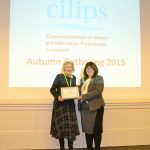 For many years she carried out her role as part of the CILIP Special Interest Group, Career Development Group, and now carries on working in partnership with CILIP in Scotland to deliver workshops and candidate support. Val, now retired from her day job with Edinburgh Council School Libraries Service, was formerly part of PTEG Mentor Support Network and for many years delivered training on behalf of CILIP. 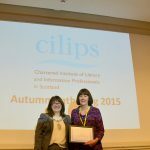 She continues to work with CILIPS colleagues to deliver mentoring support and training, often in partnership with Ruth across Scotland for professional colleagues undertaking the PKSB. In her role as a children’s author, Theresa has published over forty books and won the Carnegie medal. She has served on the Board of Scottish Book Trust, the Advisory Committee for Public Lending Right in the UK and coordinated the Scottish Writers Project. 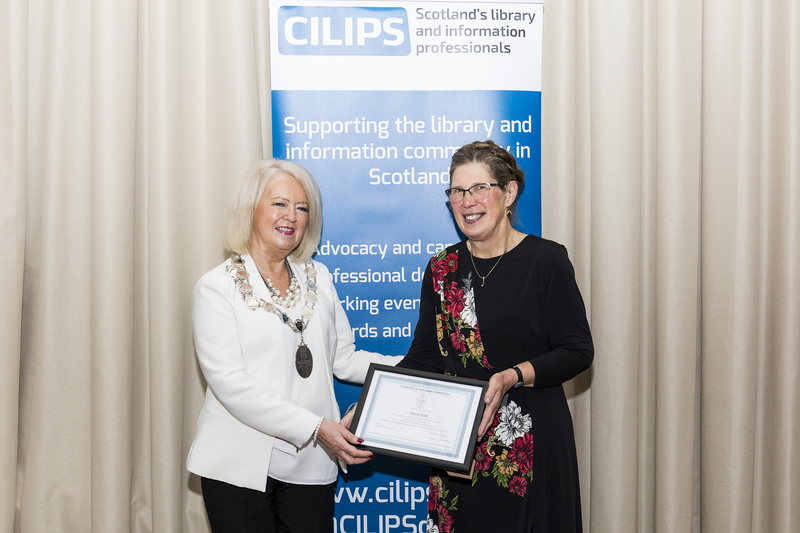 During 2016, in her role as CILIPS President, she has offered encouragement and inspiration to the membership throughout Scotland and continues to contribute to the work of CILIP in Scotland as a member of our Trustee Board. 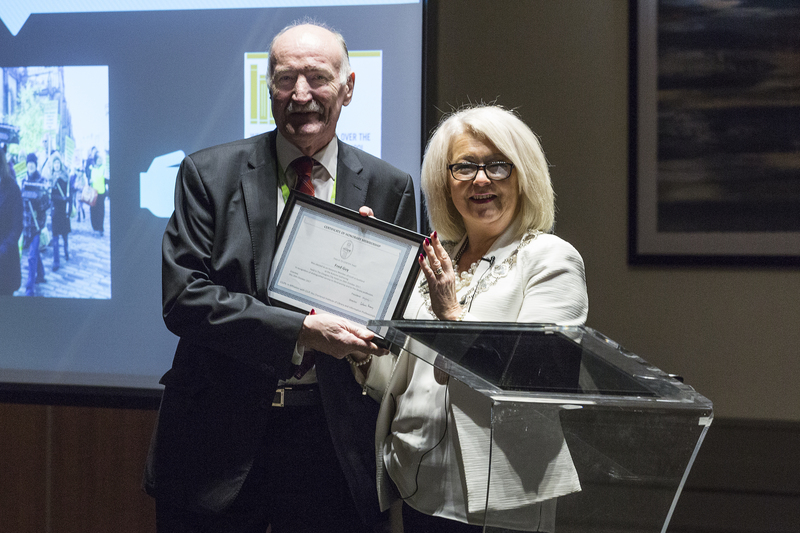 Recently retired, Fred, throughout his career has been committed to the development and advocacy of cataloguing and indexing professionals in Scotland for which he received the Alan Jeffreys award from CIGS in 2015. Fred worked in HE libraries before joining the National Library of Scotland where his achievements included creating the first mass digitisation project which saw NLS printed catalogue records stored as electronic data; working in cooperation with the Russian State Library he helped to progress the installation of a modern library automation system before leaving NLS to take charge of the SUNCAT project at EDINA. 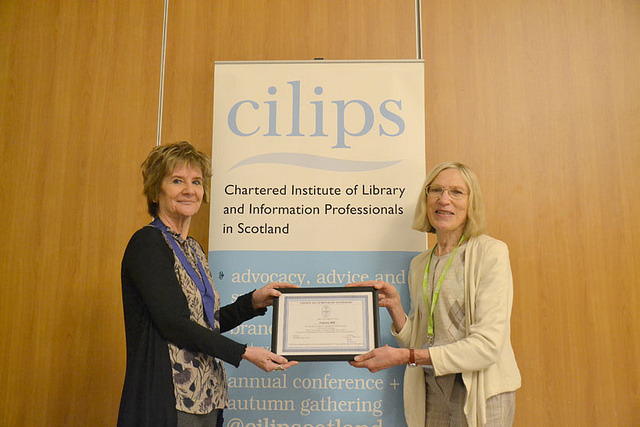 Involvement with the CILIP CIGA saw him continue to make a significant contribution to sectoral initiatives over the years including ‘Information for Scotland’ and the Web2 seminar series. Elspeth works as a school librarian in Dundee where she is a passionate advocate for the role of school librarians and in particular their role in promoting information literacy. She’s been an extremely active member and Board member of the School Library Association for more than 25 years. Within her school, Menzieshill High in Dundee, Elspeth has built a central role for the school library in delivery of Curriculum for Excellence. She’s featured in Times Education Scotland for her work in teaching literacy across the curriculum and has written and presented extensively on many topics from establishing a secondary school library policy through planning book events to evaluating the performance of the school library. Guy is a longstanding senior professional at CILIP and worked to assist SLA and CILIPS on matters of procedures, information and committees. He has a background in public library practice and worked with EBLIDA (Executive Committee) on ebooks and the Eright to Read Campaign. He contributed greatly to the committee of Devolved Nations and is the CILIP resident expert on devolution differences. 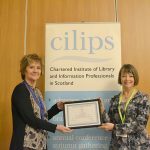 Craig has served as CILIPS Trustee Board Chair and steered the Memorandum of Understanding with CILIP to a joint agreement. 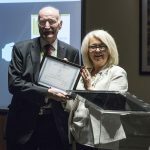 He pioneered the first networked library catalogue set up through Glasgow’s college sector called the ‘Next Generation Libraries Project.’ Craig also remodelled the SLIC Innovation and Development Funding Award scheme and developed a whole college transferable CPD programme based upon the CILIP PKSB. He promoted information services including web and intranet services as part of a common corporate communications culture and contributed to setting up the JISC Scotland office and service. 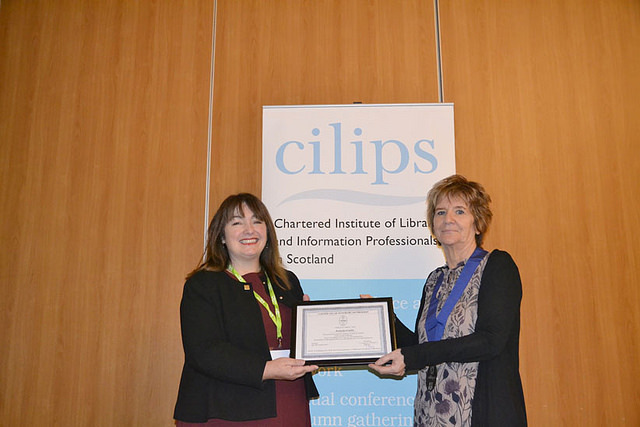 Anna provides outstanding support to the professional development of the members of CILIP and is committed to CPD within the profession. She provides mentor to members, delivers workshop and training for CILIP candidates and is an assessor and member of PRAB. 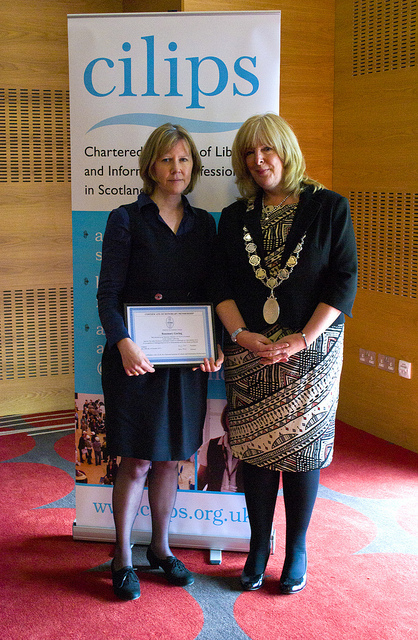 Anna had a leadership role at Falkirk Libraries for the past 18 years. Ian is the Former Librarian of Govan High School where he supported teachers and pupils alike. In his spare time, he applied his professional library and research skills to documenting the history of the school, local area, and former pupils and staff, much of which has been published. Now retired, he continues to spend time as volunteer archivist at Govan High School. During the 1980s, he also served as NALGO steward during the Strathclyde school librarians strike for better pay and professional recognition. A long time champion of information skills, Ian is still an active member of the Information Literacy Community of Practice, and in recent years has worked with the Health Alliance to develop the Health Literacy Toolkit and worked with Northumbria University to set up contact with Edinburgh School Libraries, resulting in groundbreaking research in pupils’ IL skills. 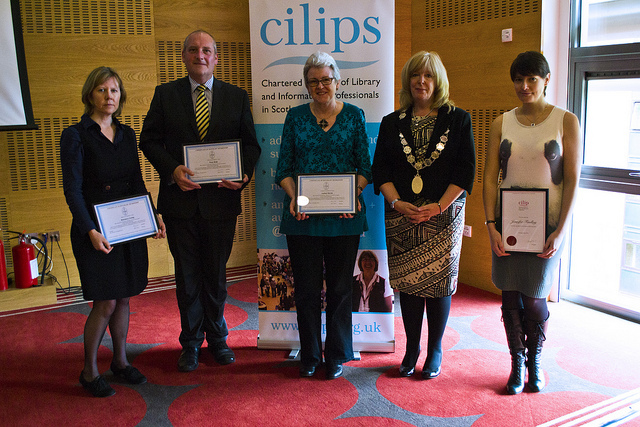 A long time CILIP in Scotland member, Ian has served as a Trustee and as a representative to the School Library Association Scotland. 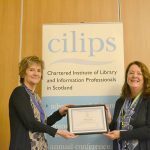 The CILIPS President of 2017, Liz is a digital champion with 20 years experience in libraries and delivered great success as Head of Edinburgh Libraries. She has a record of service development and advocates for libraries and for the profession. 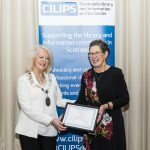 Liz introduced the ‘Scotland’s Library Information Professional of the Year’ award, was a Scotland Women in Technology finalist 2017 and one of Scotland’s Top 10 Digital Disruptors 2016.